DAY 27: More food – nachos! I’m a little embarrassed/ashamed about how many of my entries for the 30-day challenge are of food that Jeff and/or I have made. But honestly, food and the making thereof are a huge part of our lives, especially since we pride ourselves in making our meals from scratch. So while I’ve indulged/cheated by taking probably too many photos of the food we’ve made, I would be grossly misrepresenting our lives if I didn’t include this culinary element in some respect. looks yummy. when can i sample some? These photos are such a tease. We need recipes too! Kidding. 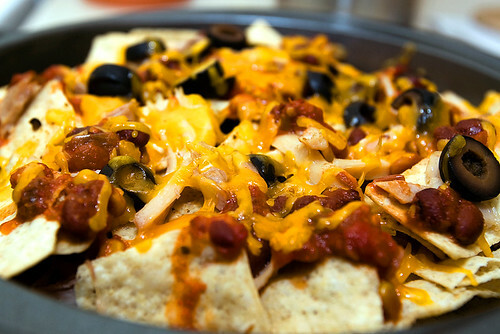 Nachos are the easiest thing to make, and there are so many varieties. Here’s what I did: I boiled two chicken thighs, removed the skin and bones and shredded the meat. (Alternately, you could chop up chicken meat and lightly fry it in oil, or use canned chicken.) Take an oven-safe pan and line the bottom with tortilla chips. Add a layer of chicken meat, with dollops of your choice of salsa, sliced olives and shredded cheese. Do another layer of chips and chicken-salsa-olives-cheese — and another, if your pan is deep enough or if you’re hungry enough. Pop it in the oven at 350 degrees for 10 minutes and then broil until the cheese is all melty.